Provided one is wearing comfortable shoes, walking around the nation's capital on a gorgeous spring day is a great way to rediscover its many treasures. Most of them are just within this great expanse of open area called the National Mall - a cultural hub in the city . What makes the visit easier on the visitor's wallet is that most of the nearby monuments and museums are free to the public. Up top is the Lincoln Memorial. The Memorial is surrounded with 36 massive doric columns representing the number of states in the Union during Lincoln's death. Meanwhile, the stoic gaze of Lincoln looks across the Washington Monument and further beyond, the United States Capitol. The last time I was here, Marine One was just dropping off then Pres. Bush on the south lawn of the White House. The current occupants, the Obamas, were at home when I took this photo and we could easily tell it from the two guys at the roof top armed with powerful scopes. This is The Castle, officially known as the Smithsonian Institution building. Any museum rat should first consider dropping by the Smithsonian Information Center located inside as it is a goldmine of information on all the 19 museums it oversees. One of the Smithsonian's most popular and my favorite is the National Air & Space Museum. Anyone who's seen the kid movie Night At the Museum: Battle of the Smithsonian will relive these real vintage planes hanging from the ceilings. This is my 3rd visit here and I'm still awed like a child. History buffs will surely remember the Wright brothers, whose invention and first flight in 1903 changed the way we travel. Their original "flying machine", as it was called back then, is now part of the Smithsonian's permanent exhibit. How times have changed! From this little skeleton to today's massive A380, aviation has really gone so far. Amelia Earhart flew this Lockheed Vega 5b during her successful attempt as the first woman aviator to fly non-stop solo across the Atlantic in 1932. Her disappearance during an attempt to fly around-the-world made her all the more famous. I never saw the biopic though. Who wants to fly to the moon? This is an actual Lunar Module built for NASA's Apollo space program which delivered the first human beings on the moon. On a lesser scale but nonetheless electrifying, Richard Branson's Virgin Galactica is already accepting reservations for its first sub-orbital space flight. Now if only I have $200,000 to pay. The Museum of Natural History gets a lot of visitors no matter what time of the year. If the one in New York has a dinosaur skeleton greeting visitors, the Museum of Natural History in Washington has an elephant in the middle of all that foot traffic. Most visitors to the museum go straight to the hugely popular Hall of Geology, Gems & Minerals which is where women say their loudest ohhs and ahhs. Talk about diamonds, rubies, sapphires and every precious stone that's been on the necks, ears, wrists and crowns of royalties, celebrities and socialites. The most famous of them all is the Hope Diamond, shimmering at a glorious 45.52 carats. Allegedly "cursed", this was worn by Marie Antoinnete who ended up losing her head during the French Revolution. The diamond is currently displayed without its setting on a bullet-proof glass standing on its own in the middle of the exhibit room. 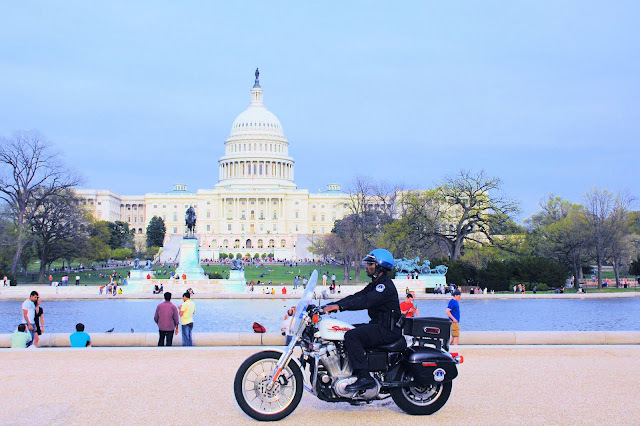 A policeman on bike patrols just in front of the United States Capitol. Thankfully, violent crime in the DC area has fallen since earning the unpalatable "murder capital" back in the 1990's. As dusk comes in and another long day ends in the capital city, the lights beam on two iconic monuments dedicated to two US presidents: Washington (left) and Jefferson (right). Postcard perfect pictures of the city ! Good job ! I need to go back to Washington D.C. and spend more time there. The Smithsonian alone takes forever to see. Great shots! these are all amazing photos. the last one is my favorite in the batch. My family and I enjoyed the movie, Night At the Museum: Battle of the Smithsonian and this post really remind me of that Adam Sandler film. You've got wonderful photos again here, dennis. Thanks for sharing. Do you think a 3-day visit to DC is enough to see the sights and visit the museums? Yes Maria, 3 days is sufficient to see the major attractions and museums (unless you really want to spend more time in each). We only stayed two days and visited only two museums. I believe there were more kids at the Air & Space Museum after having seen the movie. Thanks Docgelo! That's true, just visiting the many museums will take a lot of time. I only managed to visit two. someday, you'll make it there Lechua. I think the movie has made the museum and the Lincoln Memorial even more popular with kids. i heard about the smithsonian but it's here that i get to appreciate it. paglaki ko, mapapasyalan ko rin iyan. florida, hawaii at california pa lang ang napupuntahan ko. pero pangarap ko rin ang washington at new york, lalo na ang NY public library. wish me luck! You always amaze me with your photographic skills, tukayo! All the pictures have just the right composition and post-processing. But the photo of Lincoln just stands out. Great angle, never seen it photographed that way before and it's just beautiful!You are lucky to explore what beautiful America has to offer! Wow. It looks more lively in the spring, when I visited DC it was in December of 2007, and people weren't outside.